Octavius Winslow stood out as a one of the foremost evangelical preachers of the 19th Century. A Baptist minister for most of his life, he seceded to the Anglican church in his last decade. His Christ centered writings show devotion, practicality, and excellence. His writings are richly devotional and warms the soul and inflames the heart with sincere love, reverence, and praise to Christ. He was a direct descendant of John Winslow and Mary Chilton who braved the Atlantic to travel to America on the Mayflower in 1620. Legend has it that Mary was the first female of the little band to set foot in the New World. In 1624 she married John, brother to Edward Winslow (1595-1655), a celebrated Pilgrim leader. Octavius’s mother, Mary Forbes (1774-1854) had Scots roots but was born and raised in Bermuda and was the only child of Dr. and Mrs Robert Forbes. On September 6 1791, when she was just 17, she married Army Lieutenant Thomas Winslow of the 47th Regiment. Shortly after this, she came under spiritual convictions and was brought to gospel deliverance while pleading the promise, “Ask, and ye shall receive”. Christ Himself powerfully told her heart, “I am Thy salvation!” and she was saved. Octavius seems to have been given his name because he was then the eighth surviving child. As a child, Octavius and family would worship at Pentonville Chapel under the ministry of Rev. Thomas Sheppard. During this time of his life, he suffered from what seemed to be a life threatening illness. While staying in Twickenham, a nurse accidentally administered an incorrect medicine that doctors would later say would have killed ten men. But it was in God’s providence that he would live. Octavius’s father was from a wealthy family but by 1815, following his retirement from the army, he suffered ill-health and the loss of his fortune due to one of several national financial disasters that occurred in this period. A decision was soon made to move to America, but before Mr. Winslow could join his wife and children in New York, he died. At the same time, their youngest child died too. Octavius was but 7 years old. Widowed at 40, responsible for a large family, and scarcely settled in America, Mrs. Winslow’s entire life was turned upside down. Worst of all, spiritual darkness and despondency overwhelmed her for many months. They were a deeply religious family and Octavius later wrote a book about their experiences from his mother’s perspective in a book entitled Life in Jesus. Mary and her children lived in New York City until 1820. Then, after a four month visit back to England, they would then move to Sing Sing, NY on the Hudson River for “four years of congenial repose”. In 1824, they would move back to New York City for a season of “special revival” where brothers Octavius, Isaac, and George would become converted and later convinced of God’s calling to ministry. According to the book A History of the Stanton Street Baptist Church, Winslow “was licensed to preach the gospel at a church meeting in October 1827, and the license was forwarded to England” when they moved there. It is suggested that Winslow began his ministerial training in Stepney, London, but then moved to Columbia College, New York. Twice he was granted the privilege of receiving honorary degrees. The first was a Masters of Arts (M.A.) by the University of the City of New York (NYU) in 1836. Secondly, in 1851, Columbia College in New York City conferred upon him the honorary degree of Doctor of Divinity (D.D.). The second degree was given mostly because of the body and scope of his written works. Winslow’s official ordination would later be on July 21, 1833 at the Oliver Street Baptist Church. After completing a short service as a moderator at a Stanton Street church, he was dismissed on May, 18, 1831 and he went on to found or “plant” the 20 member Bowery Baptist Church which was organized in March of 1833 and met in the Military Hall on the Bowery. After meeting in this Hall for a year, they relocated to Broadway Hall and renamed the church Central Baptist Church. These years would bring the church a “moderate degree of prosperity” and would bring Winslow trials of depression. When Winslow would later leave this flock, there would be no written records as to why he left. He is said to have ministered in the newly started Second Baptist Church there in Brooklyn on the corner of Tillary and Lawrence Streets in 1836 and 1837, the work sadly closing in 1838 and the church was sold to the Free Presbyterian congregation. In 1839 he moved back to England where he became one of the most valued ministers of his time. This was largely due to the earnestness of his preaching and the excellence of his prolific writings. His son, John Whitmore Winslow, died in 1856 at age 21 and Octavius went on to publish some of the things he had written as a teenager. His daughters Ann Bruce would die on October 22, 1848 and Sarah Johanna would also die on July 3, 1848. Then, years later on October 3, 1854, his beloved mother Mary would pass into eternity. Hannah Ann, his faithful wife, would later die on October 9, 1866. Octavius would never re-marry. Winslow spent most of his life in England. He pastored a baptist Church on *Warwick Road in Leamington Spa, Warwickshire (1839-1858) where he followed Rev. D.J . East. In 1858 he became the founder and first minister of Kensington Chapel, Bath. In 1865 the church became a Union Church (mixed credobaptist and paedobaptist). This latter event probably marks a changing attitude in Winslow who in 1867 left the Baptist pastorate and in 1870 was ordained an Anglican deacon and priest by the Bishop of Chichester. For his remaining years he served as minister of Emmanuel Church, Brighton, on the south coast. In 1868 he had produced a hymn book for this very congregation. This church was destroyed in 1965 and a Baptist church erected in its place..
Winslow died, following a short illness, on March 5, 1878, in Brighton at the age of 69. His obituary attributed his death to heart disease. He was buried in Abbey Cemetery, Bath along side of his wife Hannah Ann Winslow and his sister Emma who died on December 21, 1890 at the age of 78. Over the years he had written more than 40 books, in which he promoted an experimental knowledge of the precious truths of God. Several of his books have been reprinted in recent years. In his time, Winslow was a popular speaker for special occasions, such as the meeting held for the opening of Charles Spurgeon’s Metropolitan Tabernacle in 1861. Some suggest there was some antagonism between the two with Winslow endeavoring to be broader than Spurgeon could allow. Admittedly, background information on Winslow is very sparse and scattered. I have done the best I could with what limited resources I have at my disposal to compile as detailed and accurate a biography as possible. It is my earnest hope that others who are interested in Winslow and who possess additional information than what is here will come forward and add to or correct this humble little work. Most information here has been compiled from a series of blog posts at “Heavenly Worldliness“, written by Gary Brady. Also, much historical data was gleaned from “The Experimental Homiletic of Octavius Winslow: Applying Doctrine to Life” by Tanner Turley, a work which has yet to be published. Lastly, there is a wonderful article (starting on page 5) about Winslow written by Rev. 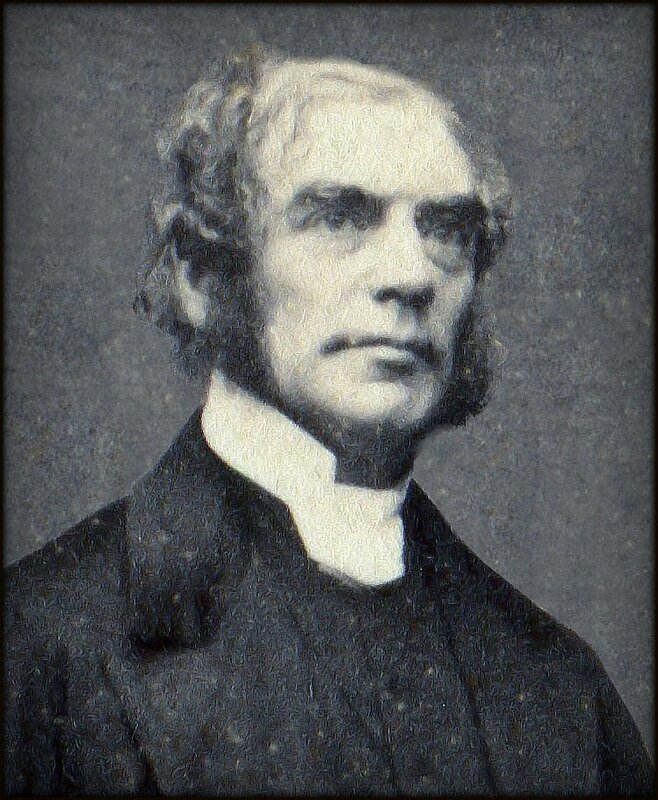 Richard Brooks of The Dales Evangelical Church in Darley Dale, Matlock (Derbyshire, England).